That sauce is to die for – seriously. And yes, that's all peppercorns. Homemade caramel. We’re making a dessert? No. 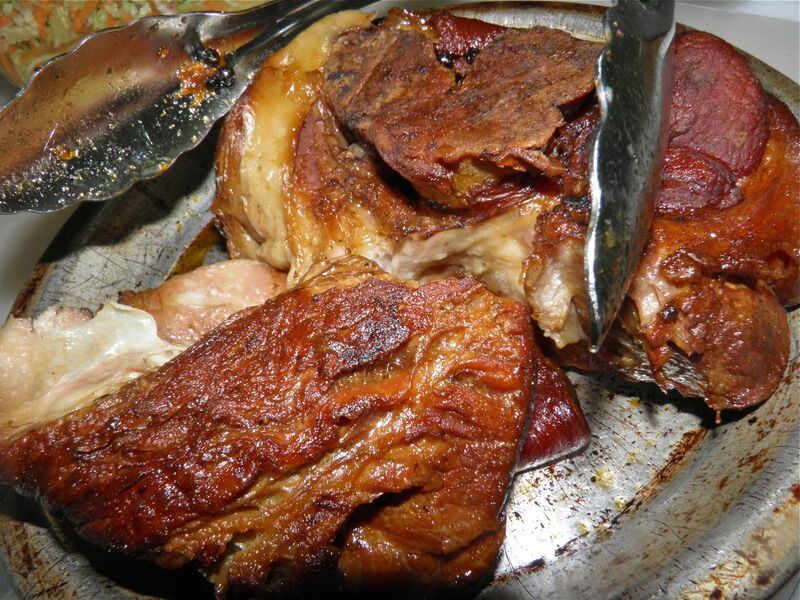 This caramel is an integral part of a delicious Asian pork recipe. This is my caramel after the additional water was added. This recipe is certainly no lemon. It’s delicious. The web site I found it on is about as authentically Khmer as you can find, I believe. It had several additional recipes handily divided into courses as well. I haven’t had time to fully explore the site. You just have to LOVE how online translations turn out. They’re often charming. This recipe's a charmer, too, and I bet fish with the sauce would be amazing. But of course I couldn’t leave well enough alone. The recipe was for pieces of pork, but I had a pork picnic roast and also was determined to slow cook it. Browned picnic roast ready to be slow simmered in the caramel. So I blended two recipes—my Peposo Noutturno (here) and this one—and came up with something that hopefully is still what a Khmer cook would recognize, but uniquely my own. I believe ribs would be fantastic in this sauce, as would tender quick cooked slices of pork as intended. It was a sauce I couldn't stop "testing" if you know what I mean. I was lucky to have enough left for the meal. Mine is far more peppery than the original. If you would like to see it, look here. If you’ve never made a caramel don’t be too afraid. If you fail once try again. It’s easy to understand if you've made it before, even if you failed – it’s only sugar and water after all. Mere pennies. Actually, the water slows the caramelization process down so making it is more forgiving than just melting sugar alone. Once the sugar and water starts to colour a bit, keep a sharp watch. The additional water (see recipe below) added after the caramel is made stops the process in its tracks. This was really delicious and tastes quite “authentic.” I’m making it again for sure, but will strain out the peppercorns. and the liquid has been reduced. 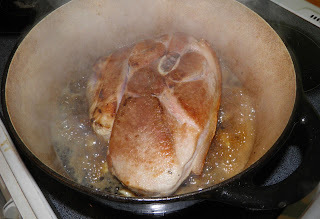 Heat the oil in a Dutch oven or other pot with a decent lid. Brown the roast on all sides. Remove it to a plate. Have the 1 cup of water ready and close by. 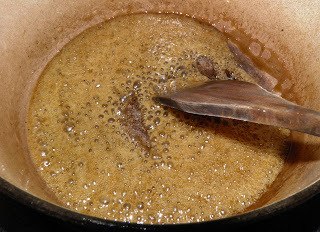 Add the 1/2 cup sugar and 1/2 cup water to the pot and stir until it becomes medium-dark brown. It will change very quickly so don’t turn your back!! I did and almost regretted it. Remove from the heat and quickly add the water, taking care not to splash yourself with any hot caramel. 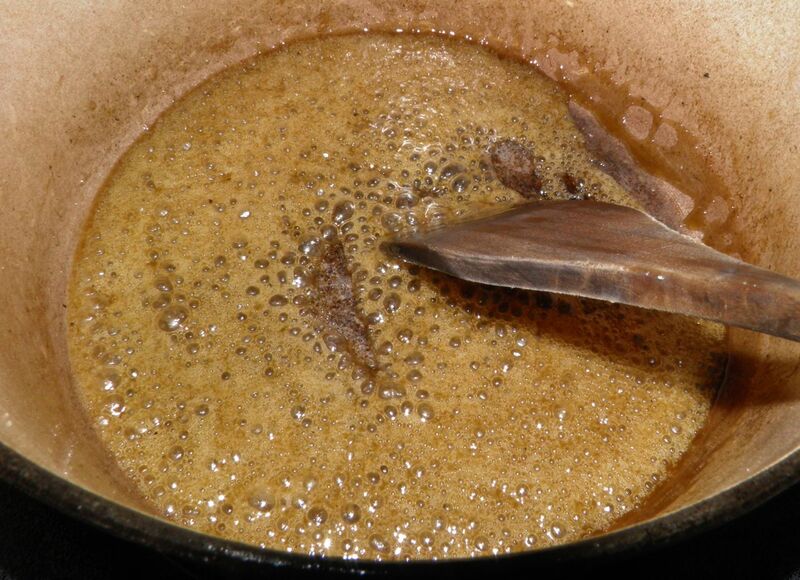 Stir until the caramel is dissolved. shredded and amazingly tender. Kind of like Asian pulled pork. If the caramel has turned very dark/red you have what is referred to as “monkey’s blood.” It’s very burnt and bitter tasting and you’ll have to do the caramel stage again… but the second time you’ll know what stage to stop at. 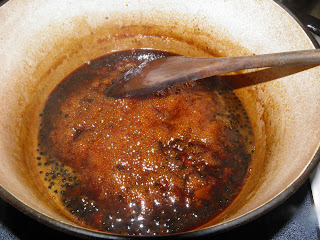 Once you have your thinned caramel, add the garlic, fish sauce, sugar and peppercorns. Bring to a boil. Nestle the roast into the liquid and reduce the heat to simmer. Cover and let cook for between 2-3 hours. The roast will be fall-apart tender. Turn once during the cooking time. After the 2-3 hours, remove the roast to a plate and turn the heat up under the opt. Reduce the sauce until it begins to thicken slightly. You should still have at least 1-1/2 cups of sauce. 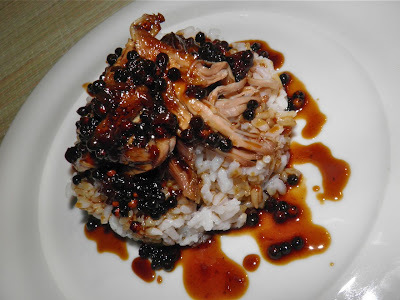 Strain the peppercorns from the sauce if you wish and serve over the pork on steamed rice. My spouse liked all the peppercorns. I could have done with fewer… so it's your choice.